American Airlines stock returned to Wall Street on Monday, emerging from bankruptcy after completing the merger with US Airways to form the world's largest airline company. The merger of American Airlines and US Airways forms a company with more passengers than previous industry leader, United Continental Holdings (UAL), which itself was formed with a merger. The deal cleared a series of legal hurdles, including an antitrust lawsuit this fall from the Justice Department and a last-minute challenge from a consumer group. It also had to win the approval of the bankruptcy judge overseeing the reorganization of AMR Corp, American's former parent company, which filed for bankruptcy in November 2011. The airlines and Justice Department settled the antitrust suit last month, and the Supreme Court declined late Saturday to take up the challenge that the merger will lead to higher airfares and fewer choices for passengers. The new American Airlines trades on the Nasdaq under the symbol AAL (AAL). Most of the shares were distributed to AMR's former creditors and US Airways shareholders. But in an unusual step for a company emerging from bankruptcy, American's former shareholders got 0.0665 share of AAL stock for each of their former shares of AMR, giving them just over 3% of the company. The new shares rose more than 7% over Friday's close for US Air's shares. US Air's former shareholders received one share in the new company for each of their previous US Air shares. Passengers likely will not see effects of the merger immediately. They will continue to book flights under the American Airlines and US Airways brands. Ticketing and frequent flier programs are expected to be combined -- at the earliest -- in 2014. The first change that will be apparent to consumers will be a combination of the frequent flier programs at some point early in the year. 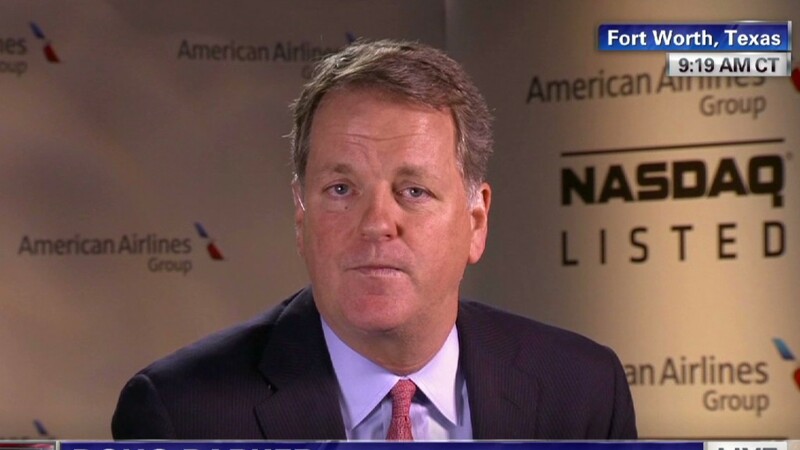 Doug Parker, the former US Air CEO who now heads the new company, told CNN on Monday that the deal will not cause a rise in fares, since only a fraction of the routes of the two carriers overlap. But to secure the deal, the Justice Department required the airlines to give up some access at two major airports. The Justice Department said this would give opportunities to low-fare airlines. Both Southwest (LUV) and JetBlue (JBLU) will now expand flights at New York's LaGuardia and Washington, D.C.'s Reagan National airports. Southwest has already said it plans to add six round-trip flights between LaGuardia and yet-to-be-announced airports. A 2012 study by PricewaterhouseCoopers found airfares "have not increased significantly" since 2004, when the first in a series of mergers produced the landscape of major carriers that exists today. Still the combination leaves four U.S. airline companies, the new American, United Continental, Delta Air Lines (DAL) and Southwest controlling more than 80% of the nation's air traffic. It was a series of five major mergers and seven separate bankruptcy filings in the U.S. airline industry since 2001 that have reshaped in industry. Executives with American have argued the combination will help customers by providing a stronger combined network that can compete with the other mega-carriers, and deny the industry consolidation of the last 13 years has hurt consumers. "We have antitrust laws we had to pass through...that will insure that any mergers...need to be competitive. This one certainly is," Parker told CNN. "I don't know if there are other large mergers in our future. What I know is we have a very competitive industry now." But the combination could still pose problems for customers. There will be some routes with less competition and fares could rise, even if network-wide fare increases are limited. And service problems, such as lost bags, delayed or canceled flights and messed-up reservations, typically spike in the months immediately after airlines move to combine actual operations. Parker said the airline decided to go slow with combining operations so as not to risk causing problems going into the holiday season. American had returned to profitability even before the merger was completed. In July, it reported a record monthly profit.